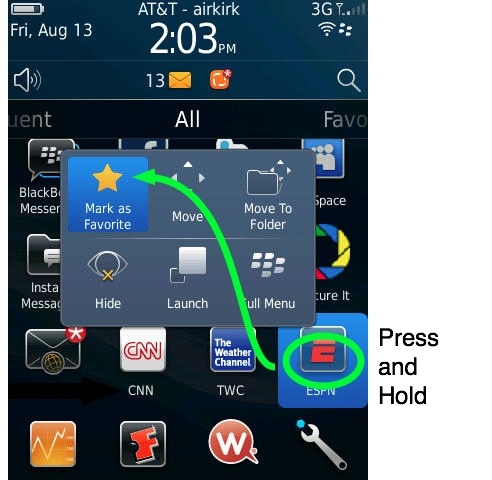 One of the new features of the Blackberry OS 6 is the Favorites section of the Navigation Bar. Here I will briefly demostrate how to access and add icons to the Favorites view. The BlackBerry Torch is the first Blackberry 6 device. I am really liking it. I really love the new navigation bar in BB OS 6. Favorites is a nice way to categorize the home screen icons. To access the various views of the home screen icons, swipe your finger left or right along the Navigation bar or on the home screen itself. This will rotate between the All, Frequent, Favorites, Media, and Download views. Adding an icon to your Favorites view is just as easy. 1. Press and hold the icon you which to add. 3. The icon will appear in your Favorites view.